Intelligent Design Ava Seersucker Down Alternative Comforter Set is very nice. The color matches my decor great. Not only does it look good but it feels fabulous. The quality of this comforter set is nice. I would definitely recommend this for a secondary bedroom. The price was absolutely great for the product. Upgrade your guest bedroom with this stylish and versatile comforter set. Constructed with a 100-percent microfiber shell, this comforter is box quilted to prevent the down alternative fill from shifting. This fun subway tile quilted design is available in multiple colors and includes shams to match. This comforter is actually much prettier when you see it than what the picture shows. So incredibly soft. The cotton is just butter soft. I would give 5 star if it was a few inches longer on the sides-- I need blankets at least 110x110 because I have a huge bed. Love, love, love this comforter! It’s so soft and light but warm at the same time. I love the color and the subway tile pattern. It’s just as nice, if not better, than a much more expensive set. Very happy with my purchase! The comforter is soft and the color is beautiful. I thought the material would feel sturdy, like the other set I bought from this company, but it feels really like polyester satin. 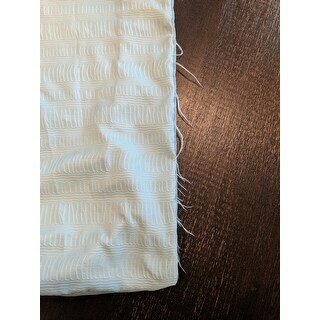 But the sham has an unfinished edge that shredded when I washed it before use. (Maybe it's a production error.) And it was flimsy, flimsier than sheets, so I won't be using it. Too busy to return and we do like the comforter. Great quality comforter set! I was pleasantly surprised with the quality of this set especially for this price point. The color is outstanding and the quality is even better. We have had this piece for a while and it still looks brand new. Love the subway stitching keeps fill from shifting or bunching. Color is great matched the sheet set perfect. The weight is perfect also. Love thus comforte! Got it in lilac and love the color as well as the subway tile look. It is also warm but not too warm, which my husband loves because he always gets hot! This comforter is very soft and made very well. I bought it for my spare bedroom and it looks amazing. Would highly recommend, very pleased with it. Very soft and lightweight. Good for warm nights or hot sleepers. Good but not great quality, a few loose threads already makes me wonder how it will hold up long term. So soft and love the color!!! Holds up great! Just as described would of loved to see more darker brighter colors as an option. The color is really pretty and the set washed very well! So soft and luxurious. Better than i expected for the price. Love it. I got the purple for my daughter ‘s bedroom. Very nice. "Does this comforter snag easily?" "Can you use this comforter set with a Duvet? I would like to use this in the summer than place the duvet set I bought on in the winter." Yes, you can use it with a duvet. "Is the full/queen big enough for there to be extra fabric for a Queen? In the past when there is a full/queen option, I have had to buy the king so we're not fighting for the comforter. I'm hesitant because I Don't Want the ends to be short." Yes, the respective sizes to match your mattress should be enough.